Here's the deal. I work at a salvage yard that has a tow service. There's a couple of bikes that have been impounded and never picked up. The one I'm interested in buying is a 99 Suzuki Bandit 1200S. It's in on shape other then a rod threw the front of engine. 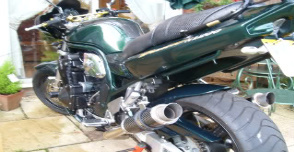 There is also a 99 Suzuki Katana 750 that has trashed from a lay down but has a good engine. I would like to put the 750 engine into the Bandit. Input wanted.